Recipients from South Africa, California, Florida, New Zealand, Bulgaria, Sweden, Costa Rica, Portugal and Dubai have been honoured in the prestigious IAGTO Awards for 2014. 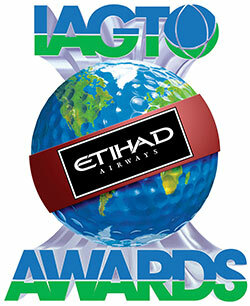 The IAGTO Awards sponsored by Etihad Airways are the official annual awards for the golf tourism industry. The 14th gala Awards evening took place on Thursday 14th November 2013 in front of 1200 golf industry professionals at the spectacular Tarragona Placa De Toros (Bull Ring), Tarragona, Costa Daurada, Spain at the end of the 2013 International Golf Travel Market. New for the 2014 Awards were four award categories recognising excellence in environmental sustainability and social responsibility at IAGTO member golf courses around the world. These Sustainability Awards were coordinated in partnership with the Golf Environment Organization. See separate press release for details. Also new for the 2014 Awards was the headline sponsorship by Etihad Airways, which was the first airline to sign up to IAGTO’s Preferred Airline scheme back in 2005 that recognised golfer-friendly airlines that carried golf bags free of charge in addition to standard baggage allowance. World-renowned golfer and 2011 Open Champion, Ernie Els, became IAGTO’s 14th Honorary Award recipient. The Golf Destination and Golf Resort awards are voted for by IAGTO’s specialist golf tour operator members that now number 516 from 62 different countries. Each was asked to vote for what they considered to be the best-performing golf resorts of the year. They considered these criteria: customer satisfaction; quality of golf courses and accommodation; value for money; support from suppliers, tourist boards & airlines; professional conduct of suppliers; and accessibility to tee times. The Undiscovered Golf Destination of the Year Award is voted for by the 180 golf travel journalists from 35 countries of the Golf Travel Writers Association, who consider the following: to what extent is the golf destination undiscovered; qualities that make for an interesting golf destination; attractiveness of the region and of the courses; golf course quality & accessibility; standard of accommodation; friendliness of the staff; value for money; speed of play; and climate. IAGTO is the global trade organisation for the golf tourism industry, comprising more than 2100 companies in 95 countries. IAGTO operators control over 85% of golf holiday packages sold worldwide and their combined annual turnover exceeds €1.5 billion. In 2012 they made the golf holiday arrangements for over 1.6 million golfers.